← Freezer Burned Meat: What Do You Do With It? 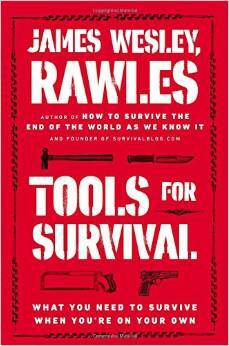 Personally, I found Tools for Survival to be a good book, probably the best he has written since Patriots. The book is basically an expanded list of the tools and other items; you will need to have a reasonably self-reliant homestead. He has chapters on everything from food preservation and cooking tools to welding and blacksmithing tools. For some of the younger members of our group Tools for Survival can be especially valuable. We older folks remember what a brace and bit was. We know the difference between a crosscut and a rip saw. But most of the younger people I have spoke with have no idea; they are used to power tools. There is a good section on fire fighting and how to protect your property. This book by itself is not going to make you a trained fire fighter, but it will help you to find the tools and the training that you do need. It includes chapters on firearms, and medical supplies and even what type of sawmill to purchase. I like his idea of using cattle guards to block road access. When you want to close the road just pull the grates. This was in his chapter on Mobility and countermobility tools. Rawles provides information on sources where these items may be purchased and makes recommendation on the best brands. Now this book is not an all-encompassing encyclopedia. But it provides you with starting points for you to do additional research into many of the areas it discusses. As with all areas of preparedness, our budget will dictate a lot of what we do. You may not be able to purchase everything he suggests, but you can go through and prioritize what you do need for your area and circumstances. I learned from Tools for Survival and I am sure most of you will. This entry was posted in books and tagged tools for survival. Bookmark the permalink.